Thursday Moda #35: Posing in Plaid with Vivian. 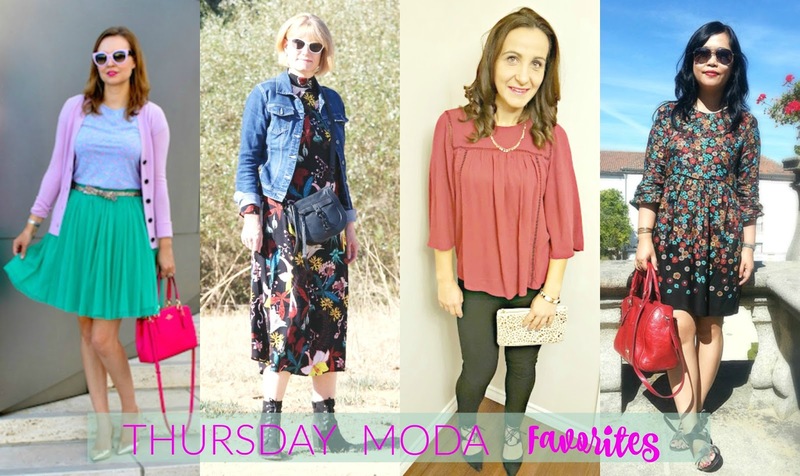 Welcome to week 35 of another stylish, trendy, colorful, bold, fashion-forward Thursday Moda. Once again like last week, I am joined by my mini-me Vivian who wanted to pose and take photos with mommy as I was snapping these pictures for the blog (before work). So instead of me wearing Pink for Breast Cancer Awareness, my daughter Vivi is my main pink accessory. She is dressed head to toe in her favorite color (I wrote more about that in this post - please read it, I can seriously use your advice). Thank you so much! Yeah so Vivian loves to pose when she is in the mood for pictures (which is not always). Where did she learn these poses from, I wonder? LOL Future style blogger, right here, right?! So this bright Kelly Green Plaid Shirtdress from Targay is one I saw on Lindsay first, last month. But September was a no-shop month for me. I told myself and even commented on Lindsay's post I would buy it in October. 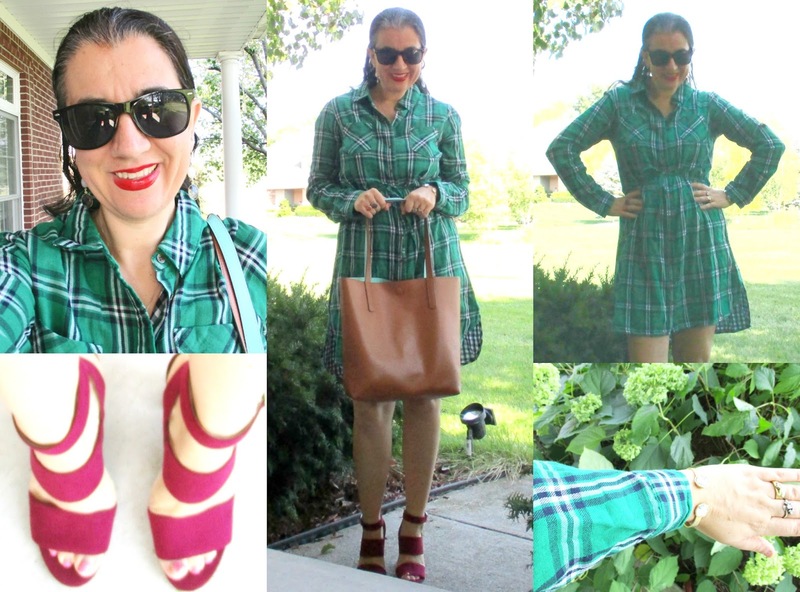 So as soon as October rolled in (possibly on Oct 1st lol), I ordered this Green+Navy Plaid Shirtdress and the one in the Burgundy+Cream Plaid, along with the Gorgeous Block Heel Cranberry Shoes I wore today, from target.com. 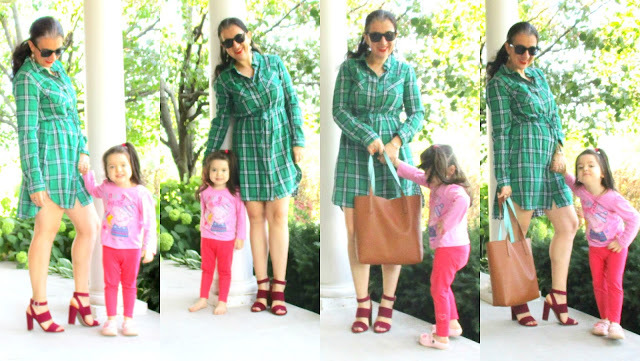 These Plaid Shirtdresses are both beautiful and lined with another plaid underneath like this one has B+W Gingham. These Merona dresses I'd say run a little small. I ordered the Medium and I loved the not-super-tight fit and the slightly-longer length. It paired so well with Burgundy and Cognac and a touch of Red too - my bright lipstick, it is this Ravishing Red with a coat of Fatal Apple (love that name) super lustrous gloss. 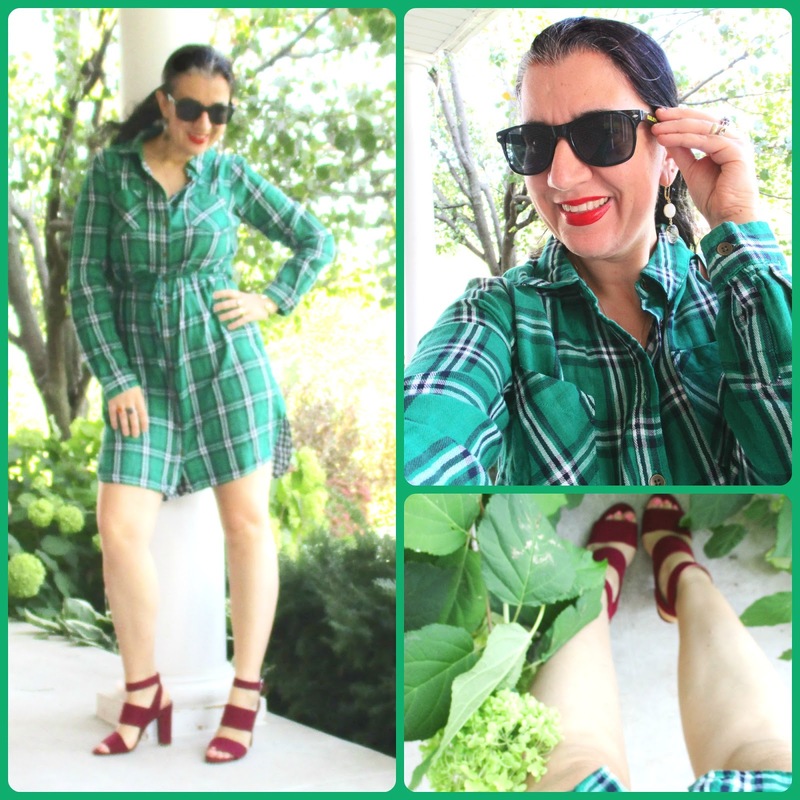 I can picture this gorgeous green plaid dress with a red cardigan and black or navy tights, and also with a cream sweater/vest and red tights, for the upcoming Holiday season. It would look super pretty no? 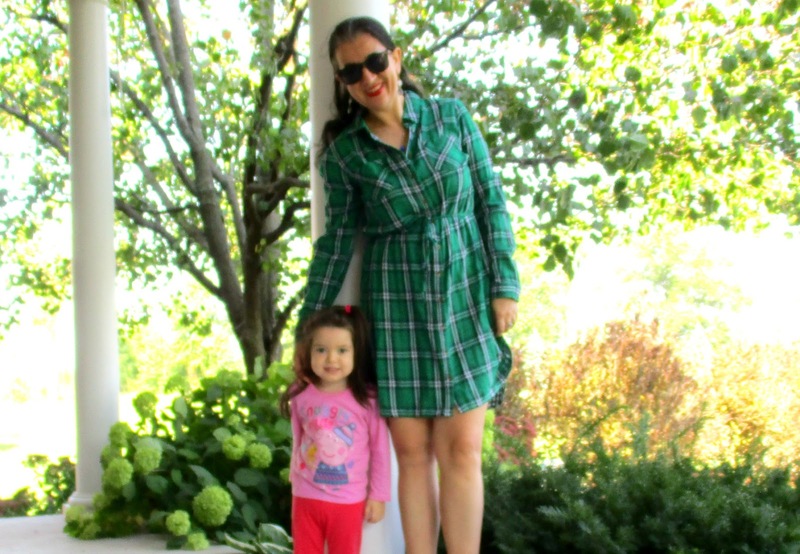 Bright Green w/ Navy+White, Long-Sleeve Plaid Shirtdress: Merona via Target (New) (identical in several color combinations, Fantastic Deal, love these), (similar in dark green, Steal), (similar sleeveless option, Great Deal), (similar hi-lo option in olive, my Favorite). Black Plastic, Classic Wayfarer Sunglasses: Ray Ban (identical), (very similar, Steal), (similar, on Huge Sale, my Favorite), (trendy modern option, Great Deal). Bright True Red Lipstick: L'Oreal Infallible Le Rouge in "Ravishing Red" (identical, a Steal and it is fantastic!). Orange Red Lipgloss: Revlon Super Lustrous Lipgloss in "Fatal Apple" (identical, a Steal and I swear by it!). Cranberry/Magenta Faux Suede Wide-Strap, Block Heel Sandals: "Allie" by Merona via Target (New) (identical, Huge Steal, love them), (open-back pump option, Great Deal, my Favorite), (similar laceup option, small Splurge, love these), (similar, Splurge). Pink Peppa Pig, Long-Sleeve Graphic Tee: Meijer's. Bright Coral-Pink Leggings: A Boutique in Albania. 120 outfits were showcased last week, a couple of new entries in the mix. Today I was smitten by a classically-cut plaid shirt that can be worn many ways and Potter's Clay - a color I love and wore a lot on the blog, last week - is the dominating color of this week's features. Besides plaid, I am in love with dark moody florals. Both dresses I featured are so pretty! 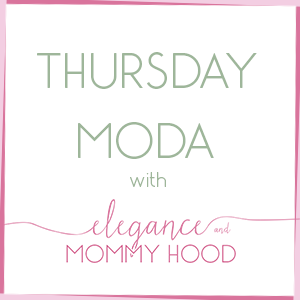 Today's Featured Blogger is SHEREE from Posh Classy Mom, who is always on her Fashion A+ game. Sheree linked this three-fer post showing us three very different yet equally stunning and crisp outfits from coast to coast with what seems like the perfect Navy+White Plaid Shirt. It is so classy and modern. I want to re-create every single outfit with a similar shirt I own. She also linked up this sweater look and this shirtdress look all of which were stunning and posh looks also. I must say the lovely Sheree totally deserves the name "Posh Classy Mom" because she is always that despite having two young toddlers. I look forward to what she links up each week because it is always beautiful and stylish. 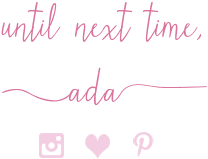 Sheree also has her own linkup every Wednesday "Midweek Inspirations" a linkup about everything not just fashion, and alongside two other stylish mammas, she co-hosts a fashion linkup every Friday, too. If you don't know about Sheree yet, please stop by and follow her. It is 'Tulle Time at Disney' for the always-colorful, always-beautiful Katie. I want all her collection of skirts and handbags including these today. The gold accents were perfect, too. Andrea hinted at this 'H&M Floral Dress' on a previous post and I was dying to see it. The moody florals, the colors, the length - it is perfect for now. Bojana is ready for a hot date night in 'Strappy Heels and Bell Sleeves'. I need to buy her pretty Old Navy Blouse. Che can still wear little dresses like this as well as light not just 'Dark Florals' since she lives in warm Spain. Both the dress and bag need to appear in my closet.